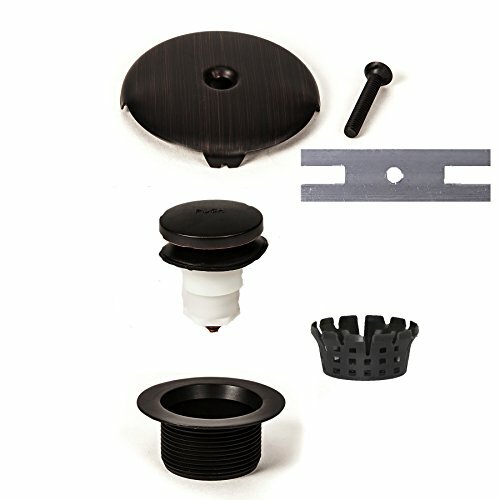 PF WaterWorks Toe TouchBathtub/Bath Tub Drain Trim Kit (Drain + Stopper + Single/One (1) Hole Face Plate) - Coarse 11.5 TPI - FREE Hair Catcher; Oil Rubbed Bronze; PF0970-ORB-TT-C by PF WaterWorks at N Online Agency. MPN: PF0970-ORB. Hurry! Limited time offer. Offer valid only while supplies last. This Bath Tub Assembly Kit includes Toe Touch Bath Tub Stopper, Bathtub Drain shoe, and Single Hole Overflow Face Plate - all with matching finishes. This Bath Tub Assembly Kit includes Toe Touch Bath Tub Stopper, Bathtub Drain shoe, and Single Hole Overflow Face Plate - all with matching finishes. Toe Touch Bath Tub Stopper is a convenient foot operated Bathtub Drain Stopper. The kit has all the components to entirely replace your bathtub drain and give it a new look. All components are made with a durable finish. Fitting adapters are included so the stopper can be used in most Bathtubs.